During the egg-laying stage, ticks lay eggs in secluded areas with dense vegetation. The eggs hatch within two weeks. Some species of ticks lay 100 eggs at a time, others lay 3,000 to 6,000 per batch. Throughout the autumn, male and female adults find a host, which is usually a rodent, pet, or human. The adult female feeds for 8 to 12 days. The female mates while still attached to her host. Both ticks fall off, and the males die. The female remains inactive through the winter and in the spring lays her eggs in a secluded place. If adults cannot find a host animal in the fall, they can survive in leaf litter until the spring. The safest way to remove a tick is to use rubbing alcohol and a pair of tweezers. Dab rubbing alcohol on the tick, and then use the tweezers to take hold of the tick as close to the dog’s skin as you can; pull slowly and steadily. Try not to leave the tick’s head embedded in the dog’s skin. Don’t squeeze the tick because it might inject some disease-causing organisms, such as bacteria, viruses,protozoa, or other agents, into the animal during the process. Risk of disease transmission to you, while removing ticks, is low but you should wear gloves if you wish to be perfectly safe. Do not apply hot matches, petroleum jelly, turpentine, nail polish, or just rubbing alcohol alone (the tick must be pulled out after application of alcohol) because these methods do not remove the ticks and they are not safe for your pet. Once you have removed a live tick, don’t dispose of it until you have killed it. Put the tick in alcohol or insecticide to kill it. 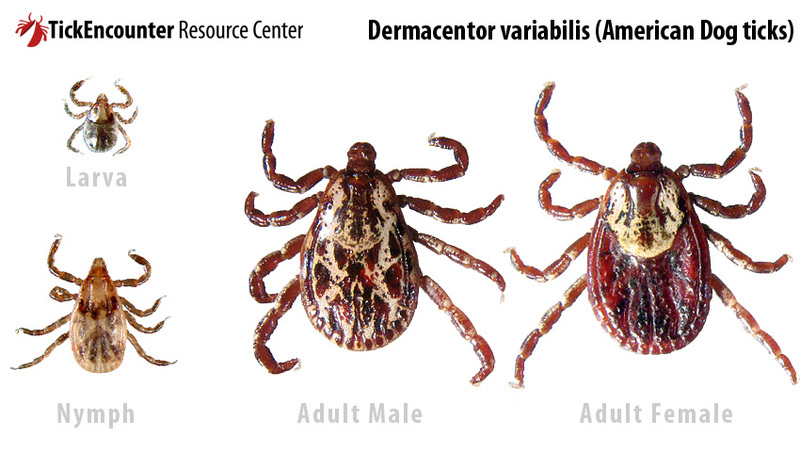 For more information on ticks, read more here! Photo taken from Tick Encounter Resource Centre.